Thanks to a follower on Twitter, who clued me to its existence, I found a new game on Google Play that reminds me of Flappy Bird, but doesn’t make me want to hit something. The game is called Timberman, and without me even knowing, it has been on the app scene for quite some time. Thanks to recent success on iOS, Timberman looks to dominate the charts with its fast, simplistic, yet highly addictive gameplay. 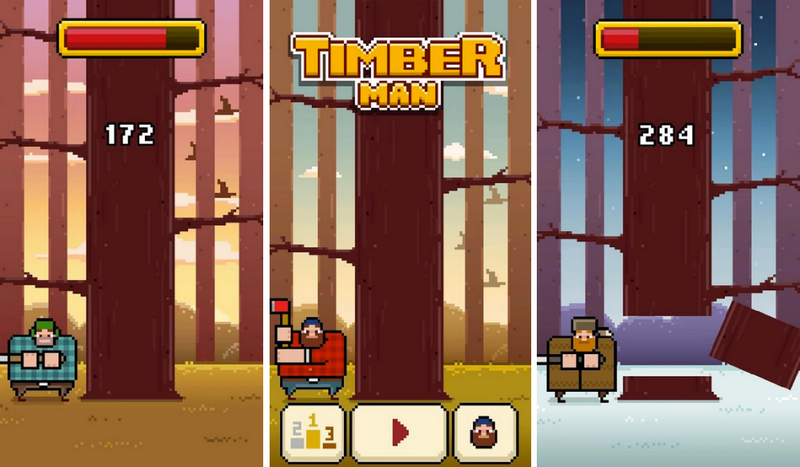 In the game, you play as a logger, looking to cut down a few trees. The goal is to see how much of the tree you can cut, while avoiding branches that are falling towards you. To avoid them, press on either the left or right side of the display, moving your character while continuing to cut the tree. Sounds easy, right? Give it a shot and see how you feel after a few rounds. In addition to fun gameplay, new characters are added regularly, allowing you to play as backwood loggers, vikings, Mr. T, and even Jason. The game is free to download, but for $0.99, you can remove ads from within the app. Go check it out.